Don't underestimate the efficacy of a banana. In addition to being the most favorite of local and international athletes, because the filling but not fattening, bananas are also very beneficial for health and beauty. The fruit is not only easy to digest, but also contains nine nutrient content and restore energy. Compared to other fruits, bananas are prone to be enjoyed because it does not need to be processed. Just so you know, a ripe banana which will contain 99 grams (g) calories, 1.2 grams protein, 0.2 grams fat, 25.8 milligrams (mg) of carbohydrates, 0.7 g fiber, 8 mg calcium, 28 mg phosphorus, 0.5 mg iron, 44 RE vitamin A, and 0.08 mg of vitamin B, 3 mg vitamin C and 72 grams of water. But to get the benefits, you need to carefully choose. Because only a ripe banana that can convert blood sugar into glucose naturally, as well as fast diabsorsi into the blood circulation. Bananas can be digested easily, so that the sugar contained therein will be converted into a good energy source for the formation of the body, working muscles and also very nice to eliminate fatigue. Women who were pregnant are encouraged to eat bananas, because they contain high folic acid is important for the perfection of the fetus, the formation of new cells and preventing birth defects occur. A ripe banana, will contain about 85-100 calories. So that by eating two fresh bananas, the need for folic acid is about 58 micrograms can be met. In addition, the banana will help keep blood sugar levels which can reduce sick morning, so the banana is very good for snacks pregnant women. The content of iron is quite high in bananas, can stimulate the production of hemoglobin in the blood for patients with anemia. Two bananas a day, very good for patients with anemia. As a fruit that can be consumed directly, bananas do not irritate or damage to the intestine for ulcer patients. The fruit is often used to fight bowel disease, because the texture is soft. 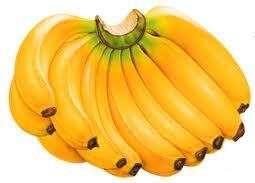 Bananas are also able to neutralize excess stomach acid and coat the stomach so as to reduce irritation. For those who have bowel disease or colic due to stomach acid, you can consume with a glass of milk is mixed in liquid. For patients with liver, two bananas a day with the addition of one tablespoon of honey, be good to increase appetite and increase strength. Especially for people with burns, you can use banana leaves as a treatment. Way, the burned skin with a mixture of ash dioles banana leaves and coconut oil. This mixture was able to cool the burned skin. Bananas contain potassium, which is a vital mineral which helps normalize the heartbeat, sends oxygen to the brain and regulates moisture balance in the body. When experiencing stress, your metabolism will increase dramatically, thereby reducing the body's potassium levels. With bananas, potassium levels in the body will be balanced. In some countries, bananas are regarded as cooling foods that can reduce physical and emotional temperature of expectant mother. In Thailand for example, pregnant women eat bananas to ensure the baby is born with a cool temperature. In an English school, 200 students able to complete the final exam only with a breakfast of bananas. They also often eat bananas during recess and lunch, because bananas can improve brain power. British School is a research respondents, and proved that the potassium in bananas to make students become more active in the learning process. On the other hand, bananas are also useful for beauty. As in other fruits, like avocado, yam and cucumber, bananas are also often used as a face mask, or to cope with damaged hair and smooth hands. Bananas also have a role in the decrease or increase the weight. A study has shown, that a person can lose weight on a diet of bananas. If you want to lose weight, how easy. Every day eat four bananas and four glasses of non-fat milk or fresh milk in a day. Do it for three days a week. Of bananas and milk, you get 1.250 calories. The menu is quite healthy for your body. In addition to weight loss, diet banana also helps skin to be more clean and not greasy. Those who want to increase body weight, consume a glass of banana shake mixed with honey, nuts and mango, after dinner. This menu if taken every day, will help raise the weight. Not many know, that banana was also able to help smokers overcome nicotine addiction. The content of vitamins B6 and B12 found in bananas, can neutralize the influence of nicotine in the body. Even the enzyme bromelain contained in bananas too, is proven to increase libido in men.